When you learn how to know Jesus, you begin an amazing journey into God’s plan for your life. Romans 3:23 says it this way: for all have sinned and fall short of the glory of God. Knowing Jesus is simply acknowledging your need for Him, believing what He did for you and accepting His amazing gift. It recognizes that you can’t live this life on your own, that you’ve sinned and are in need of a Savior. And the good news about knowing Jesus, about being saved, is the beautiful exchange that happens in that moment. You give Him all the bad and sinful things you’ve done, and in return, God gives you everything He has for you. Whether you know it or not yet, His plan for your life is amazing, and this is the first step on that journey. Jeremiah 29:11: “For I know the plans I have for you,” declares the Lord, “plans to prosper you and not harm you, plans to give you hope and a future.” Isn’t it comforting to know there’s a plan for your life? Regardless of what’s happened along the way, regardless of the wrong turns and missteps, God has been leading you to this very moment. In fact, He’s been leading you right to Himself. The fact of the matter is your ultimate hope and future both lie in Him. That simply means, you can live your whole life with and for Jesus. And because of Him, because of His promise to never leave you or forsake you, you’ve now got something to be very excited about! Jesus, I know that I have sinned and am in need of a Savior. I believe that when you went to the Cross, you went there for me and all my sins. I trust You to save me right now. I give you my life. Today, I know I’m saved and that You forgive me, but help me to understand what it means to live for you every day. Amen. You’ve been called to live a full and exciting life in Christ and we want to help you start your journey strong. We’ve been given a beautiful gift of salvation and it is our honor and calling to share that gift with a hurting world. It’s never too soon to be equip yourself. Click here to learn more. 89,416 others have also learned how to know Jesus. 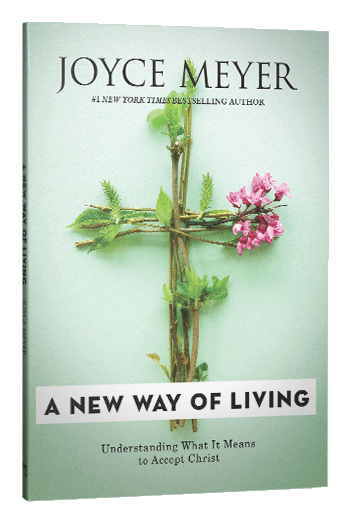 To get a free download of Joyce’s book A New Way of Living and also receive weekly emails full of great content that will encourage and help you along the way, simply fill out the form. If you would like a physical copy of the book instead, please call us at 1.800.727.9673 (outside of US/Canada).